Classic Ground Beef Taquitos. Crunchy and delicious appetizers. Dip them into salsa or guacamole, and it’s like a piñata breaking in your mouth. When I want to indulge at a Mexican fast food restaurant, I get an order of your Classic Ground Beef Taquitos. Then football season comes around, I take out my fat girl pants, and I get my grub on! Making this dish should NOT be a chore. Chores are for 9-year-olds, not busy people like you and me. 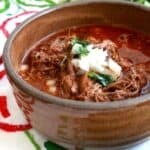 I’m going to give you some shortcuts on how to prepare the meat for your Classic Ground Beef Taquitos. Tip 1: Got leftover ground beef? Add it to a pan with your favorite salsa. Let it simmer for 5 minutes. 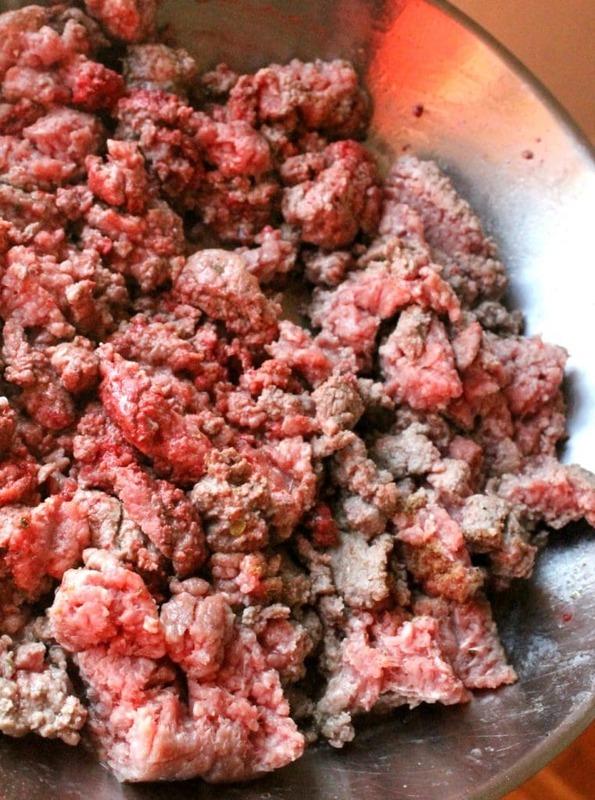 Tip 2: Got uncooked ground beef? Cook it. Drain it. Add your favorite salsa. Let it simmer for 5 minutes. Now you are halfway to eating some taquitos without visiting your amigos at the Mexican restaurant down the street. You want to use corn tortillas for your Classic Ground Beef Taquitos. Unfortunately, they don’t fold very easily. I think it’s something in the way they are processed. To make the tortilla pliable, you have to nuke them for 30 seconds in the microwave. Or if you don’t believe in microwaves, stick them in a warm oven for a few minutes. If you don’t warm them up, the tortilla will break on you. This will making rolling the taquitos very difficult. No bueno! Toothpicks . Remember when you were a kid, and they would hand them out at restaurants? Nowadays, I hardly ever see them. I only use them when I am rolling up some Classic Ground Beef Taquitos. Once they are cooked, don’t forget to take them out, or someone could get hurt. If you are not interested in frying the taquitos, you can put them in the oven. 425 degrees F for 20 minutes, or until golden brown. I know there are some of you who do not eat red meat. 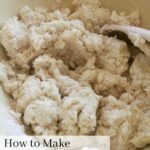 Instead, you can use ground chicken or ground pork and follow the same procedure. 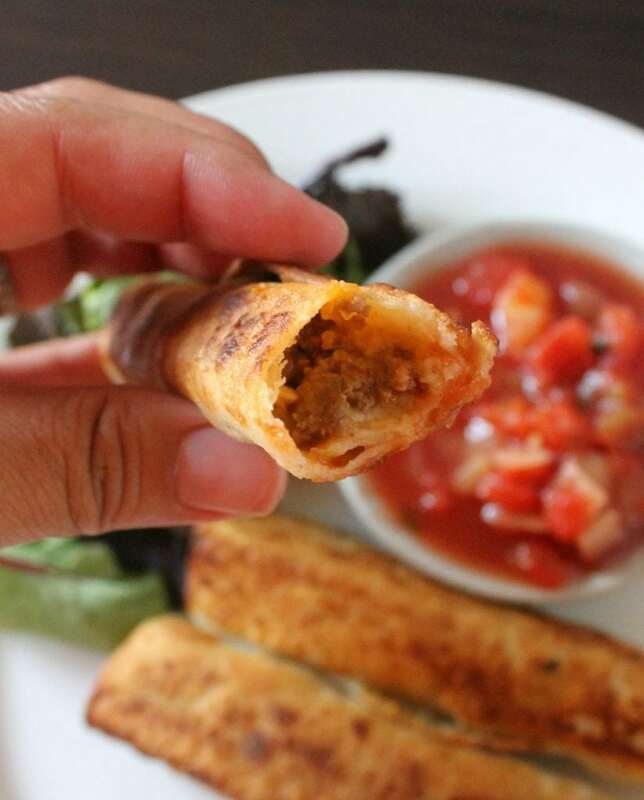 For those of you with a deep frying, the Classic Ground Beef Taquitos will cook in half the time. 3 minutes in the fryer, and they are ready. I used canola oil to fry the Classic Ground Beef Taquitos. What kinds of healthy oils can you use for frying? Extra light olive oil and sunflower oil are excellent oils. They have unsaturated fats for a heart healthy diet and a high smoke point perfect for frying. Cook ground beef, drain, and return to pan with your favorite salsa. Let simmer for 5 minutes. Then remove from heat. Warm tortillas in the microwave for 30 seconds. 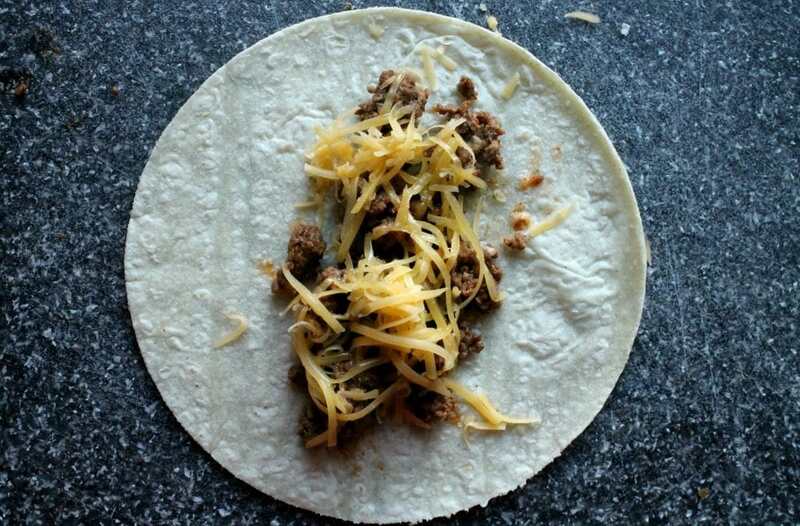 Add a spoonful of ground beef to the tortilla. 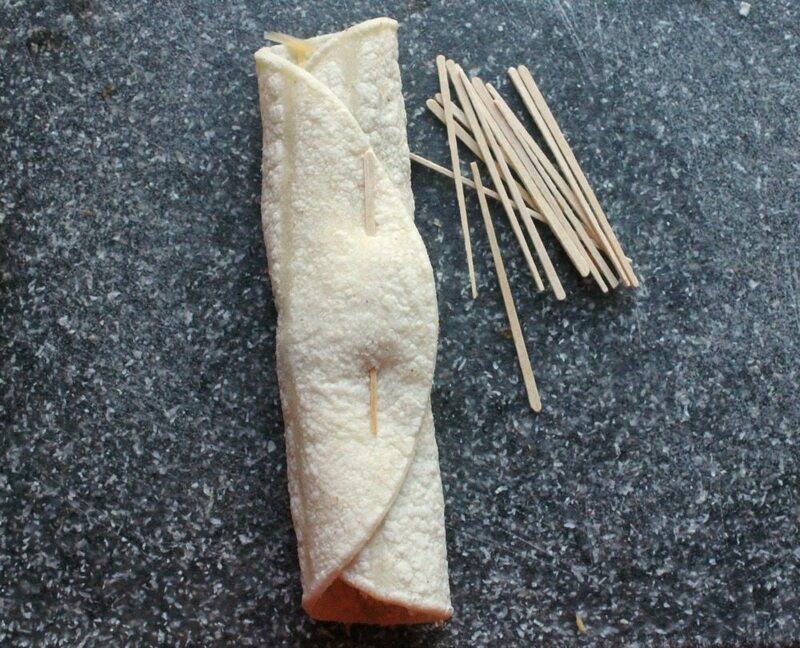 Roll up and tie with a toothpick, as shown in picture above. Fry taquitos 3-minutes on each side, or until golden brown. 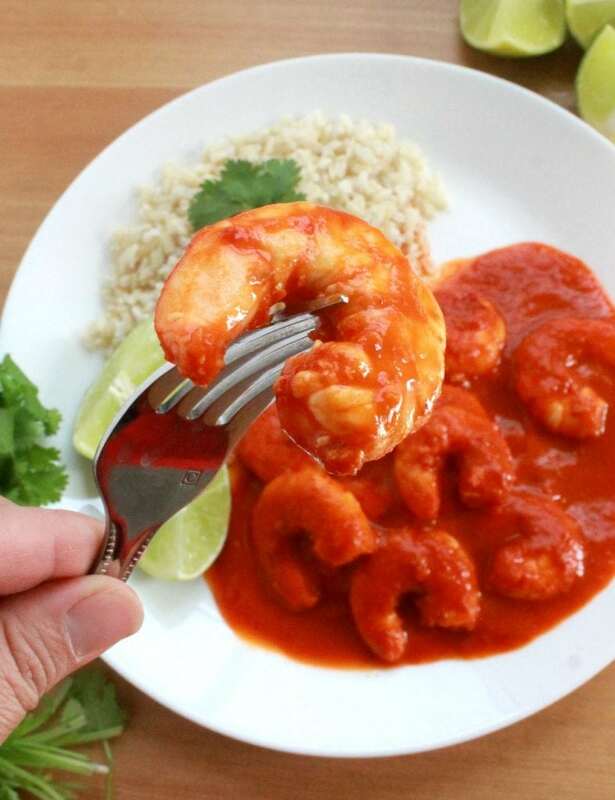 Serve with salsa and/ or guacamole. NOTE: Do not overcrowd the pan, or they will not cook properly. Bake or fry the taquitos as normal. Place them in a freezer bag and freeze. To reheat, wrap the taquitos in a paper towel. Note: They will not be as crispy as when they first came out of the oven. Fully cooked, taquitos last 3-4 days in the fridge. Fully cooked, taquitos last up to 3 months in the freezer. Something to be aware of: Taquitos are great for game day or the Super Bowl. Be very careful when leaving food out for several hours. You can get sick or your guests sick. Basically, they are the same thing. My family is from Durango, Mexico. It’s a northern state. I grew up thinking taquitos were made with corn tortillas, and flautas were made with flour tortillas. Then, I started traveling around Mexico and learned that some people called taquitos “flautas.” Trust me, I was very confused. What I do nowadays is if I see the word “taquitos” or “flautas” on a menu, I ask what type of tortilla they are using: corn or flour? I also ask what part of Mexico they are from. I’m always curious to see what people call their foods in different regions. Oh yum! I make something like these often but hadn’t thought about frying them after rolling them up. I’ve never tried taquitos, but wow these look delicious! Going to have to try these soon! Mind blown! I can’t believe you’ve never had taquitos before. 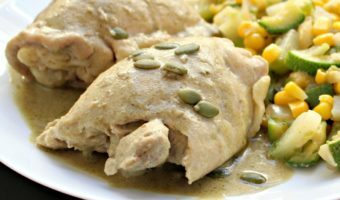 You MUST try this recipe out or order them next time you’re at a Mexican restaurant. They look so delicious! I have to try them! Yes, you must. Hope you like them! I have been craving these all day since I saw your Instagram this morning…this post is making is even worse!! These look so good!! LOL. I know the feeling. I wish I had a batch of these myself. 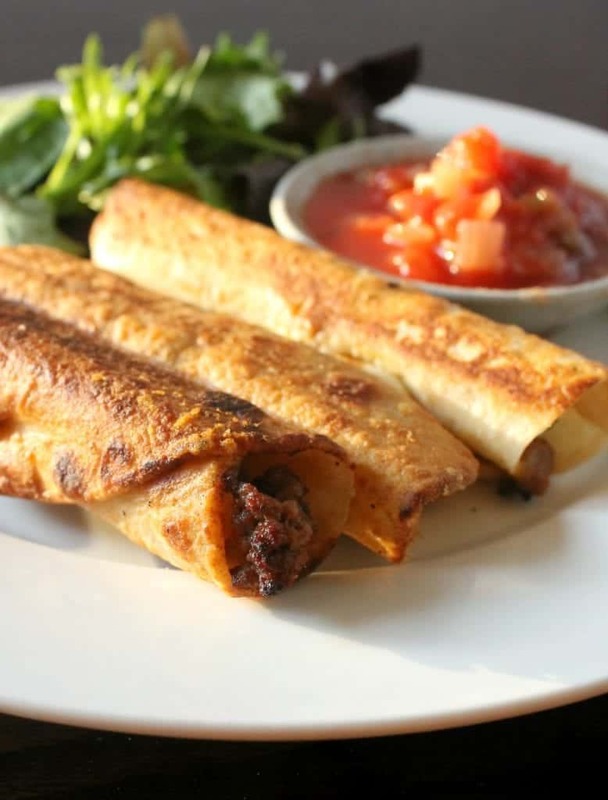 This beef taquitos recipe looks wonderful! I can’t wait to try this great new dish! Thank you for sharing! Goodness, these look good! My family would love these. Can I bake these instead of fry them? Yes, of course. 425 degrees F for 20 minutes, or until golden brown. 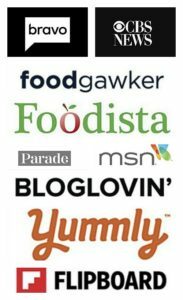 What brand of oil would you reccomend using? Thanks for the awesome looking recipe! lol. You’re too funny. Taquitos are sooo good! Hope you liked them. 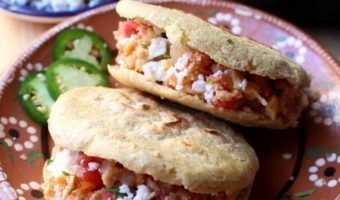 I made these, but when it came time to load the tortillas, the tortillas couldn’t take the meat and totally crumbled! I warmed them in the microwave and everything! I had to send the husband out to get some flour tortillas and go from there. They are in the oven now, hopefully they will still be good! Oh no! Sounds like the tortillas were either too wet – sometimes they can pick up moisture – or they were old. It’s really hard to tell if they are old on the shelf. I actually think it has to do with the preservative they use, but I’m not 100% positive on that. The ones on the end of the stack will sometimes be wet. Instead, use the ones in the center. 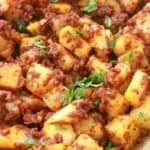 You can also make this recipe for ground beef taquitos with flour tortillas, but to me then they are called flautas. How did they turn out in the end? They were delicious! Good enough that I’m back again to make them tonight! (And going to teach my 10-year-old to make them.) I love a good simple recipe. We are going with the flour tortillas again, and I made some Chuy’s jalapeno dip to dip them in. Thanks for the recipe, we love it, even though it didn’t turn out as planned!